Who is Terry Hershey ? Many of us the live near Terry Hershey Park in Houston’s Energy Corridor enjoy the beautiful trails along buffalo bayou almost every day. The further along the trials you travel and deeper you get it becomes so peaceful you can forget you are in the middle of the fourth largest city in the United States. I see the billboard at the Memorial Drive entrance to the park with Terry Hershey’s photo and a little write-up about her almost everyday. I wanted to find out more about the parks name sake and I found a very good article about her at the Memorial Park Conservancy website. Here is a brief quote from the article. 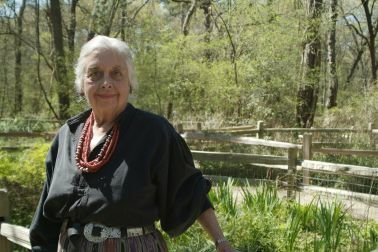 Her first advocacy venture into the parks and recreation field occurred in the 1960s when she learned that Buffalo Bayou, the main river in central Houston on which her home is located, was being straightened and stripped of vegetation. The next morning she gathered some neighbors and went to visit the site. They saw nine acres had been flattened with all the existing tree cover removed and rubber tires were being burned on the site. At that point, there was a natural meander in the Bayou. It had been removed and the channel had been straightened as a “flood control prevention” measure. It made no sense to Hershey to straighten a river and concrete it. This only resulted in flood transference, not flood alleviation. It seemed obvious to her that this merely created flooding downstream and that a coincident consequence was destruction of the ecosystem. Today again we are fighting the City of Houston and Harris County to stop the destruction of this beautiful park and forest that so many of us enjoy. If you don’t know about the city’s plans to destroy this park please visit the BriarForest Super Neighborhood website and find out more. As a Houston Real Estate Agent serving West Houston and a long time resident along the Buffalo Bayou and Terry Hershey park I understand the value this park brings to our area.